Each kit is complete with hull, sails, masts, oar banks and appropriate fittings. 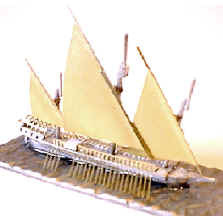 Sails which are set (open) are in photo etch brass; furled sails are in white metal. A feature of this series is the brass photo etch oar banks: individual oars which are attached to a spru that's designed to fit on to the hull. Each kit contains a list of contents as well as diagrams to facilitate assembly. Please note that some hulls are cast in resin (where indicated *; all other castings are white metal. Available for REN 14, 15 and 16. Click heading above for more details. Lasert colour flags and decorations for poop deck awnings and armings. Each sheet has over 70 items in total. Sheet includes 2 fo'castle armings (decorated protective screens); 10 pairs of side armings; 16 poop deck awnings and 17 flag/pennant sets. Sheet includes 10 pairs of side armings; 14 poop deck awnings and 16 flag/pennant sets. For best results, fold two halves together and secure with watered down PVA. 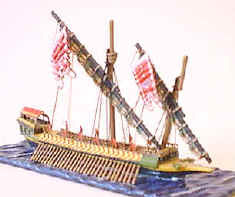 Hull in its own sea base, bow platform, main & fore mast and main & fore furled sails. Picture of assembled, unpainted model. Click on link below to see pictures of finished, painted models.